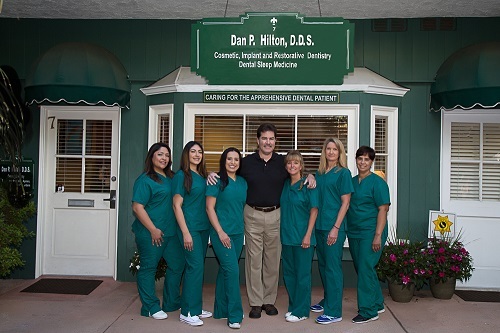 Meet our Woodland Hills Dental Team | Cosmetic Dentistry | Dan P. Hilton, D.D.S. Woodland Hills Dental Team - Dan P. Hilton, D.D.S. Our Greeting Team consists of Adrianne (Office Manager) and Christina (Insurance Specialist/Hygiene Coordinator), along with Corry and Judy for general reception. Our Hands On Dental Assisting Team consists of Brenda (R.D.A.E.F. State Board Certified Registered Dental Assistant with Expanded Functions duties), Corry (R.D.A.E.F. ), Rosemary (R.D.A. ), and Adrianne (R.D.A.). Our Hands On Dental Hygiene Team consists of Cheryl, Caroline, and Liana (all State Board Certified Registered Dental Hygienists). We are certified as a staff in all aspects of sedation dentistry. We passed State Board certification for Intravenous Sedation Dentistry and all aspects of medical emergency preparedness for the safety of our patients. We are all CPR and AED certified. Our staff is well trained in understanding treatment options for patients experiencing the effects of sleep apnea and snoring.